How are Passover and Shavuot linked? Passover is when we remember the Exodus, and Shavuot is when we remember the giving of the Torah. We build up our anticipation for receiving the Torah by counting down the days from Passover to Shavuot. This period is called the counting of the Omer. What is an Omer? Four campfire-made recipes after the jump. The Omer was a unit of measure of barley that was offered in the Temple on the second day of Passover. The counting of the Omer is a somber time, when Rabbi Akiva is commemorated. Rabbi Akiva took part in Bar Kokba revolt. He defied the Roman emperor Hadrian’s edicts not to practice or teach Judaism. Rabbi Akiva taught thousands of students. A plague arrived in Israel. Twenty four thousand of his students succumbed to it and died. Weddings, parties, dancing, and haircuts are traditionally not conducted during the counting of the Omer. On the thirty-third day of the counting of the Omer, there was a break in the plague. We celebrate this miracle by lifting the mourning practices that are observed during the rest of the counting. “Lag” is the number thirty-three in Hebrew letters. “Lag B’Omer” means the thirty-third day of the counting of the Omer. Lag B’Omer is a joyful time when people light bonfires. Dinner is cooked in the embers and is eaten outside under the stars. Celebrants sing Israeli folk songs, and dance horas around the fire. Place all the ingredients in a large piece of heavy-duty aluminum foil. Fold the foil over the food, so it forms a pocket. Cover your foil pocket with another piece of foil, so it doesn’t leak. Bury your foil packet in the embers. Allow it to rest there for at least 30 minutes. 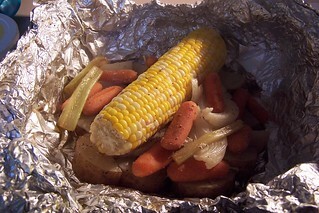 Place an ear of corn that has been peeled on a piece of heavy-duty aluminum foil. Brush with olive oil. Sprinkle salt and pepper over the corn. Wrap with the foil. Wrap your packet with another piece of foil. Bury the corn packet in the hot coals for about ten minutes. 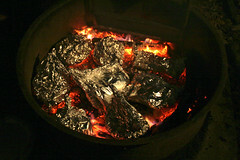 Remove the corn packet from the coals, and allow it to rest on the side. The steam will continue cooking the corn. Open the foil packet carefully, allowing the steam to escape. Peel one section of the banana. Cut an incision on the side of the banana. Fold the peel back into place. Wrap well with aluminum foil. Wrap again with a second layer of aluminum foil. Place in the fire for ten minutes. Enjoy your warm banana-gooey melted chocolate dessert! Place all the ingredients in a foil pocket. Wrap with another piece of aluminum foil. Bury in the hot coals for around 30 minutes. According to the sages the TORA (Ten Commandments) was given on the 6th of SIVAN. There is actually no Festival celebrating the anniversay OF THE TORA. Shavuot is the only Festival in the TORA that has no date. The date is set by counting seven weeks from the time of bringing the fist crop of barley to the Temple. The sages fixed the first day of the counting of the Omer as the second day of PESACH = Passover. ATZERET = Shavuot sometimes it falls on the fifth, sometimes on the sixth, sometimes on the seventh [of SIVAN]. How? if both months [in between] are full then it is on the fifth, if both are leap then it is on the seventh, if one is full and the other is leap then it falls on the sixth. We see from the TALMUD that there is no fixed date for SHAVUOT, that is why we have to cont the days from the OMER = first crop of the barley, to SHAVUOT = the first crop of wheat. With the modern Jewish Calendar SHAVUOT is always on the sixth of SIVAN, which, as said, is the date of MATAN TORA, but according to the TALMUD Shavuot has no fixed date, and therefore has no association to MATAN TORA.